Eduard (Eddie) Efimovich Gufeld was born in Kiev, Ukraine on March 19, 1936 and died on September 23, 2002 in Los Angeles at the age of 66. Gufeld played in his first chess tournament in 1953 at the age of 17. 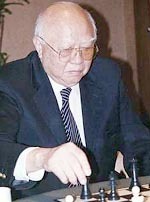 He became an International Master in 1964 and finally became an International Grandmaster in 1967. In 1977 his Elo rating was 2570 and ranked 16th in the world. In 2000 he had a USCF rating of 2565. He was the trainer of Maya Chiburdanidze who became the youngest women's world chess champion in 1978. He later became coach and trainer of the Soviet men and women Chess teams. He was a prolific author of books and had written more than 100 chess books, which sold 3.5 million copies worldwide. He was considered as the world's most flamboyant chess grandmaster. He was one of the most travelled grandmasters in chess history. He visited over 100 countries. In Russia he earned the status of "chess emeritus." In 1973 he won a game against Bagirov and considered it his best game, his Mona Lisa (lesson 38). In his day, Gufeld defeated Tal, Spassky, Korchnoi, Bronstein (6 times), Polugaevsky (4 times), Taimanov (3 times), and Smyslov. He drew with Petrosian, Kasparov, Karpov, Geller, and Keres. He will also be remembered for starting the FIDE Committee on Chess Art and Exhibition and being instrumental in reviving the chess brilliancy prizes in top tournaments. He was a great player and an even greater ambassador of Chess. He was a generous man and will be remembered by many all over the world. I remember when he used to say to those who laughed at his English,” "I think that my English is better than your Russian!" Here is Gufeld's Immortal Game, The Mona Lisa of Chess. In the 2nd clock match between IM Jimmy Liew and 8 juniors, Jimmy Liew recorded 7 wins and 1 draw. The players who took part in the match were Lee Joo Hui, Albert Ang, Camilia Johari, Hew Zhen Jing, Tan Wei Hao, Qistina Johari, Olivia Madhavan and Ian Parr. The match which was played at Wilayah Complex, Kuala Lumpur, was jointly organised by IM Jimmy Liew and Kids for Chess Program (Collin). Final position in Ian's game against IM Liew, with White to play. Categories: Age Group (Male, Female), Women, Open, Special children (OKU), Veterans.